Today, I'm reviewing the musical Love Me or Leave Me (1955), which stars Doris Day as torch singer Ruth Etting. This article is part of The Doris Day Blogathon hosted by Love Letters to Old Hollywood. Love Me or Leave Me (1955) gave "America's Sweetheart" Doris Day the chance to prove her considerable acting chops as legendary torch singer Ruth Etting. When Love Me or Leave Me begins, Ruth Etting (Day) is a Chicago dance hall girl who longs to become a famous singer. After she catches the eye of local gangster Martin "The Gimp" Snyder (Cagney), he gets her a job at a local nightclub and eventually becomes her manager and husband although Etting carries a torch for her piano player, Johnny Alderman (Cameron Mitchell). Etting's talent soon lands her gigs on Broadway and in Hollywood, even as her marriage to the tempestuous Snyder starts to unravel. Etting was one of the most popular singers of the 1920s and 1930s, and her sensational life story was still familiar to moviegoers in the 1950s. MGM paid Etting, Snyder, and Myrl Alderman (his first name was not Johnny as depicted in the film) for the rights to their biographies with the intention of starring either Jane Powell or Ava Gardner as Etting. 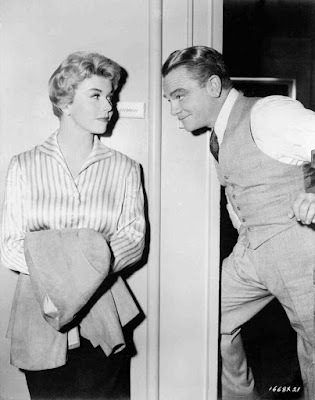 Day lobbied for and eventually got the role partially due to a strong recommendation from Cagney, who had worked with the actress in The West Point Story (1950). Etting, Snyder, and Alderman were all unhappy with the way they were portrayed in Love Me or Leave Me -- once you see the movie, you'll understand why -- but theirs was a decidedly minority opinion. Love Me or Leave Me was a huge box-office and critical success that won an Academy Award for best original story and earned Cagney a best actor nod. The movie's soundtrack was also a big hit, rising to No. 1 on the billboard charts and giving Day one of her signature songs in "I'll Never Stop Loving You." Doris Day and James Cagney on the set of Love Me or Leave Me (1955). Viewed today, Love Me or Leave Me is a lavish and gripping film that is one of the last great MGM musicals. Day gets to perform many of Etting's signature tunes like "Ten Cents a Dance" "My Blue Heaven," and "You Made Me Love You (I Didn't Want to Do It)," and she really gets to strut her stuff during the elaborate Ziegfeld follies number, "Shaking the Blues Away." Ironically, Love Me or Leave Me is also something of a swan song for Cagney, who would retire in 1961 after appearing in writer and director Billy Wilder's satire, One, Two, Three. His portrayal of the mercurial Snyder, whose warped obsession with Etting comes to torment and haunt her, is the last in a long line of Cagney's great performances as mixed-up mobsters. The actor is at once terrifying, repulsive, and sympathetic, and he cements his legendary reputation in one powerful scene where Snyder and Etting get into a physical altercation (if you want to know where Method actors like James Dean, Al Pacino etc. get their shtick, watch Cagney in this movie). However, the most revelatory performance in Love Me or Leave Me belongs to Day. It goes without saying that her singing is outstanding, but she also gives a performance of great emotional depth. In fact, Day is one of the few actors who ever really matched Cagney onscreen(the only other example I can think of is Pat O'Brien in Angels with Dirty Faces). Usually Cagney's films are tour de force performances relying on his unmatchable energy and charisma (think Yankee Doodle Dandy), but Day more than holds her own, and it's not just because she has all of the flashy musical numbers. Day portrays Etting as an emotionally complex woman who is trapped by both her gratitude for Snyder's help and her growing fear of his violent personality. In fact, Love Me or Leave Me belies her unfairly earned reputation as a perky personality who was only good in light comedies and bouncy musicals. Watch this film and you'll realize that Day was one of the few actors that went up against Cagney and won. Here's wishing a very happy 95th birthday and many more to Ms. Day. I leave you with this clip of her performance of the title tune in Love Me or Leave Me. Love Me or Leave Me will air at 1:45 p.m. July 11 on TCM. It is also available on DVD, Blu-ray, and video on demand. What a wonderful post on "Love Me or Leave Me!" It is definitely an entirely different role and character for Doris Day, but she, undoubtedly, always surpassed everyone's expectations! Fantastic review, Amanda! The film is, indeed, "lavish and gripping..." I wholeheartedly agree!!! 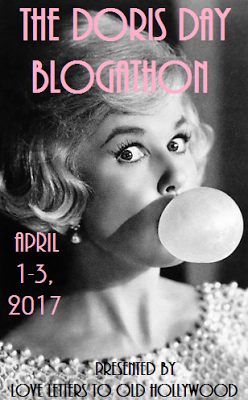 Doris Day Blogathon - "Celebrating My BIRTHDAY with DORIS DAY!!! -- A Dazzling Look at Doris Day's Flair for Fashion in Film!!!" This film is essential to the blogathon because it demonstrates what a great range Day has, so I'm really happy that you were able to write this wonderful piece. Have you read Cagney's autobiography? He had a lot of respect for Day and considered her one of the best actors he ever worked with. That says a lot coming from a master like him! It does say a lot. Cagney's bio is at my local library. I'm going to have to check it out. I love your point that the way she holds her own is not because she gets all the songs, but because she had it in her to hold her own against Cagney. This is probably one of my very favorite films and I really enjoyed your post on it! Awesome review! I haven't seen this film in a long time, but I remember it for its priceless score and Doris Day's amazing and unusual performance. Great review. I am not a fan of this movie, I think because of the way Cagney's character treats Day's character. Thank you for submitting to The Classic Movie Marathon link party.